The performance double standard extends to virtually every aspect of recruit training. Over the past decade, female recruits have consistently scored below their male counterparts in every quantifiable category minus the gender-normed physical fitness test. Yet despite the statistics, historical records do not indicate that anyone has ever seriously considered why females have consistently been outperformed at boot camp. Acceptance of the status quo has simply become the norm. Ironically, notwithstanding the delta in female-male performance, a greater percentage of female recruits are promoted by contract to private first class upon graduation, meaning they are also more swiftly promoted to lance corporal in spite of potentially being less qualified. This is essentially where the Marine Corps meritocracy cart goes off the rails. The relief of Colonel Germano has been widely covered in the news media; criticism of the Corps surrounding her dismissal has at times been unsparing. The Gazette’s decision raised a new question: Had the Corps exerted pressure on the journal’s editor to pull Colonel Germano’s article, and thereby squelch her voice? For the Gazette’s part, the reasons behind the decision to pull the article were simple, Mr. Keenan said. 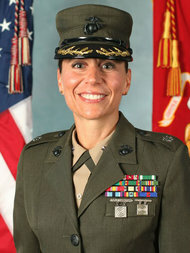 Colonel Germano’s relief complicated prospects for publication in the journal not just because it had damaged her professional credibility but also because some readers might see publication as an implicit endorsement of her position in her dispute with the Corps about being fired. Mr. Keenan also said, however, that whatever the perceptions about Colonel Germano’s dismissal, her article contained valuable insights. “Personally, I feel there is a lot of validity to what she is saying about, ‘Don’t hold women to lower standards,’ ” he said. Late last week, after hearing of the Gazette’s decision to kill her article, Colonel Germano provided the draft to The New York Times, with permission to publish it on this blog. In a phone call on Monday, she said she did not want to focus on her relief from command, but to use this moment as a chance to acknowledge the shortfalls in how female Marines are made, with hope of reforming the Corps in a way that will be more combat effective – and respectful and fair – for men and women alike. Do you agree with Colonel Germano’s article arguing that women who enlist in the Marine Corps should not face lower expectations for accountability and performance than their male peers? Why or why not? What can be done to improve gender integration? Share your views in the comments section below. A selection of responses will be posted later this week. In order to get at the root of this question, we must first examine how success is quantified at recruit training. The Marine Corps is unique in that it maintains gender-segregated enlisted entry-level training. All women who enlist are trained at Fourth Recruit Training Battalion on the Marine Corps Recruit Depot Parris Island. Regardless of gender, each recruit is expected to pass the initial strength test (IST) comprised of a mile-and-a-half run, flexed arm hang or pull ups, and abdominal crunches. Each recruit must then pass a series of nonsubjective graduation requirements, including academic testing, practical application testing, swim qualification, and the physical and combat fitness tests. They must also qualify on the rifle range with the M16-A4 service rifle. The culminating test for every recruit is the Crucible – a defining event requiring endurance and teamwork for more than two days with little food or sleep. Only after successful completion of these requirements can a recruit earn the title of United States Marine. Other than gender-normed physical and combat fitness tests, there is no difference in how graduation requirements are evaluated or scored for males or females. Unfortunately, that is where the parity for males and females in training ends. In general, from the instant a female applicant joins the delayed entry program (DEP) she faces lower expectations for accountability and performance than her male peers. Females are often allowed to miss applicant physical fitness training, seldom hold leadership positions within their respective recruiting substations, and are frequently allowed to ship to recruit training in spite of not having made progress with their physical development, all of which is observed firsthand by their male counterparts. As a result of this double standard, many female recruits arrive at boot camp utterly unprepared for the mental and physical rigors of training. Even more significant, their male counterparts arrive at recruit training with well-established preconceptions about the difference in accountability for men and women in the Marine Corps based on their observations in the DEP. The double standard is reinforced by the fact that, despite most females having an average of five months in the DEP, their IST failure rate is historically nine times greater than that of their male counterparts. For decades, female recruits have been trained in general isolation from their male peers. Female recruits are primarily trained on a compound in a removed location on the Depot with its own recruit exchange, chow hall, health clinic, classrooms, and squad bays. Female-male recruit interaction is strictly limited to occasionally sitting in the same large classroom for instruction or attending church on Sundays. There is very little male-female socialization during training. The bottom line is that gender bias in the Marine Corps starts in the DEP and continues at recruit training in part because the males believe the females don’t work as hard – mainly because the males rarely see their female counterparts during training. Further, the segregation of female recruits and drill instructors during training creates a sense of mystery about how female Marines are made – even though they follow the same training schedule and regulations as the males. If females are held to lower standards for performance from the day they join the DEP, it stands to reason that they will continue to underperform at recruit training when surrounded only by other females. Because they aren’t challenged to compete with their male counterparts during physical fitness events, most only aspire to achieve female standards for physical performance, which many would justifiably argue are too low to begin with. The truth is that when female recruits are held to higher standards, they rise to the occasion. This was clearly evidenced in Fourth Battalion following recent changes to the conduct of the final Crucible hike and the subsequent Emblem Ceremony where successful recruits are formally made Marines. For years, the females and males on Parris Island conducted the nine-mile hike back from the Crucible separately, only to link up for a joint Emblem Ceremony at the Iwo Jima statue after the hike. Conspicuously, a line of chairs would be staged behind the female formation for recruits who were too “exhausted” or sore to stand. Conversely, there were no chairs staged behind the male formation. It was simply expected that the females would fall out of the formation, and fall out they did because there was no set expectation that standing through the ceremony was part of earning the title of U.S. Marine. Fourth Battalion has worked to make the final Crucible hike a joint male-female evolution to strengthen the mindset that all recruits are expected to work hard and meet the same standards in order to earn the title of U.S. Marine, regardless of gender. It has not been without a fight, however. Many senior personnel on the Depot are adamantly opposed to conducting a co-ed Crucible hike. None of the critics have been able to articulate why it would be bad for the Institution, particularly since males and females hike at the same pace of three miles per hour and all hikes elsewhere in the Corps are integrated. Despite assertions that a joint hike would cause more females to drop out and lead to more injuries, neither has come to fruition. Since we implemented co-ed hikes, our female recruits have completed the hikes without slowing the males down and more female recruits actually complete the hikes instead of getting into a van midway. Clearly, it became an insult to “train like a girl” when it became normal to expect less from female recruits. If we are to make a lasting impact on how female Marines see themselves and are perceived by others, we must demand more from them right from the start. High standards for performance should never be gender-normed and, barring physiological differences, concrete evidence shows that women can perform to the same standards as their counterparts if it is demanded of them. In Fiscal Year 15, the Fourth Battalion witnessed this phenomena firsthand at the rifle range. 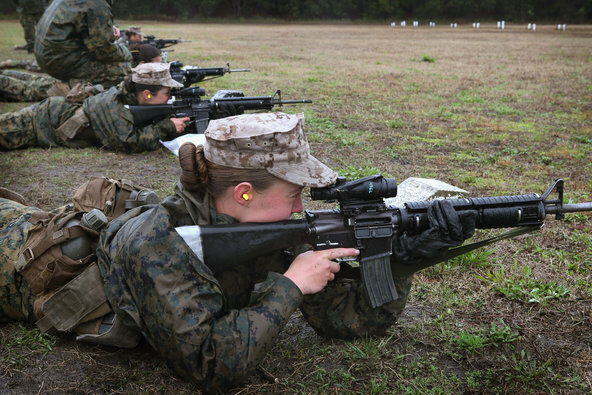 For decades, the female initial qualification rate on the rifle range at Parris Island hovered between 67% – 78%, compared to 85% – 93% for the male training battalions. The male battalions also produced significantly greater percentages of rifle experts and sharpshooters. In Fiscal Year 15, however, the Fourth Battalion drill instructors received a defined intent for success on the rifle range, and through a strong partnership with Weapons and Field Training Battalion were able to achieve an unprecedented 91.68% female initial qualification average. The key to success was establishing the firm expectation that change was both possible and necessary to improve the credibility of our female recruits- come-new-Marines. Once the drill instructors, coaches, and primary marksmanship instructors began to see success, the movement became contagious. For the first time in history, female recruits are competitive with their male counterparts on the rifle range, proving it is not an insult to “shoot like a girl”. However, for lasting improvement across all of the testable categories to be realized, the Institution must be willing to critically examine the environment in which Marines are made and implement radical changes. The Marine Corps has consistently touted that gender segregated training is healthy in that it provides female recruits the environment they need to develop self-confidence. However, if it is automatically assumed they won’t be able to compete with their male counterparts to achieve stellar results, the expectation that females will somehow magically develop confidence simply because they are led by female Marines is unrealistic. Isolation of female recruits does nothing to foster a climate of mutual respect, nor can it be said that it contributes to their self-confidence. The assumption that confidence can be created without hard work and high standards is patently false. As football coach Bill Parcells once said: “You can’t dream up confidence. Confidence is born of demonstrated ability.” This applies to outward identity as well. Most female Marines will tell you that the adoption of the male dress blue uniform by women won’t increase their sense of belonging or identity as a Marine. If a female recruit or Marine is held to less rigorous standards for conduct and performance, no new cover or dress-blue coat will camouflage the existence of gender bias. High standards should be demanded of all recruits and Marines in order to eliminate performance and conduct double standards and drive the Marine Corps towards a true meritocracy. The continued passive acceptance of diminished standards for females simply because we assume they are less capable of achieving high standards is contrary to our very ethos and is corrosive to our character as an elite fighting force. Until every leader demands the best from our recruits and Marines regardless of gender and the Institution truly considers the benefits of a more integrated approach to boot camp, it will continue to be an insult to “train like a girl”.